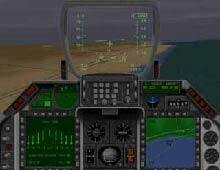 This is a Falcon flight sim from the same people who brought Hind and Apache Longbow into the world. The graphics engine from Hind was souped-up, and a later patch brought 3DFX support (which is much easier to program than Direct 3D, in my humble opinion). The graphics are not bad at all, but are nowhere as good as the contemporary F-22 Lightning from Novalogic. Then again, Novalogic's Lightning was an arcade game disguised as a sim, while DI's game was fairly realistic. The missions are varied, but there is no dynamic campaign here, and there is no mission planner either. This somewhat limited the appeal this game exerted on me, which was only restored with the weapons modelling. Launching laser guided bombs is very realistic and very, very difficult (if you pass over the target, you will lose the laser lock). Despite this, I cannot really recommend anyone to buy this game right now, unless you are also interested in Hind and Apache, as these three games are sold by DI as Front line fighters, a compilation. The recent Falcon 4.0 is the king of F-16 sims, and you should be able to get it cheap now. Falcon 4.0 is better in every respect, and a truly classic flight sim, which was marred by the idiots who rushed it before it was complete (it took a year of patches to make the best military flight sim ever).